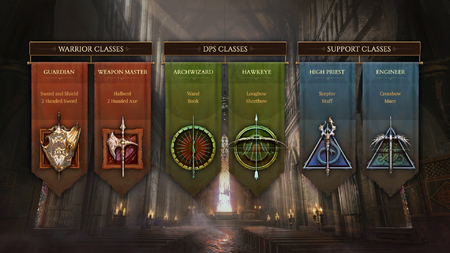 Ashes of Creation class list. Primary archetype is on the left. Secondary archetype is on the top. The sixty four (64) classes are partitioned into eight primary archetypes. Balancing of active skills only relates to these eight primary archetypes. There are four primary groups of augments assigned to each base archetype. Balancing of augments relates to the four augment groups for each of the eight archetypes. Balancing in Ashes of Creation is "group focused". Certain secondary archetypes are capable of "bridging the gap" between their counterpart. Eight players of the same primary archetype can band together to create monumental effects during a siege. The classes will need to be in the same group or raid. The primary archetype (of a class) cannot be changed. When players choose their primary class, it’s not just dictating how the next several hundred hours of gameplay will go... It’s only the primary class that cannot be changed. And hey, that’s what alts are for! 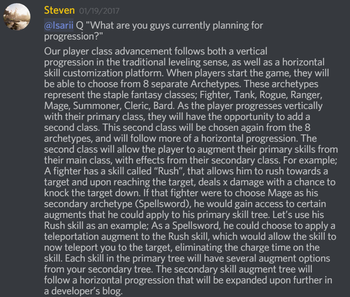 Secondary archetype of a class may be changed, but not "on-the-fly". This may be done through a quest system. Players will likely need to speak to a NPC in a Village node or above to enable them to change their secondary archetype and skill augments. 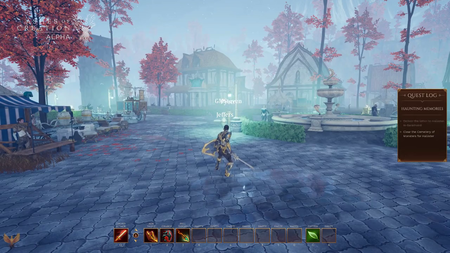 The secondary class choice, which comes after some time getting used to the world of Verra, will be more fluid. If you choose the Fighter and the Rogue to make a Shadowblade, but eventually want to try your hand at Summoning to make a Bladecaller, you’ll be able to do so. There will not be a class trial system in Ashes of Creation. A player's choice of race will influence their racial abilities. Each race has different base stats. Races are not gender or class locked. Some classes may work better with certain races but nothing is enforced. The race "seeds" a player's base stats. The primary archetype grows the base stats. The secondary archetype (class) further grows the stats. Ashes of Creation has the traditional trinity of Tank, DPS and Support/healer roles. Although traditional roles are present, players should not feel branded by their primary archetype. 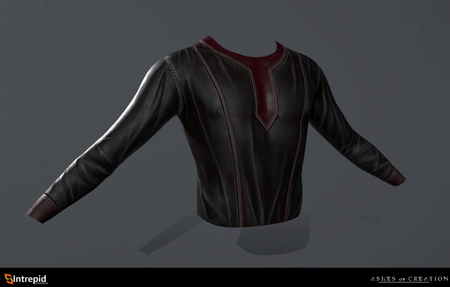 Skill augments available through the class system allow characters to be personalized outside of their primary role. Players can also double down on their archetype choice to strengthen their primary role. Weapons and armor are not class locked, but certain classes are more efficient with certain types of weapons or armor. Certain abilities require certain items to be equipped. Alpha-0 civilian clothing by Keith Kovach. There won't be an active character creation screen in Alpha-0, but there will be several options for players to choose from. Four playable archetypes: Cleric, Mage, Ranger, Tank. The other four archetypes are planned for Alpha-1. Two playable races: Kaelar, Empyrean. Testing third-person MMO camera mode for Alpha-1. 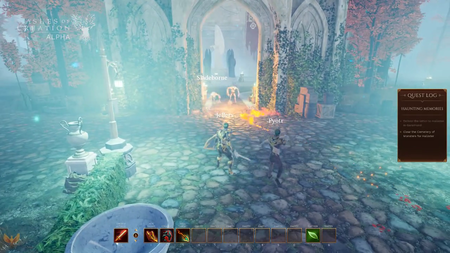 Alpha-1 (previously called Alpha-1 phase 2) is a testing release of Ashes of Creation. Alpha-1 will test hybrid action/tab combat. Now expected in Ashes of Creation Apocalypse. 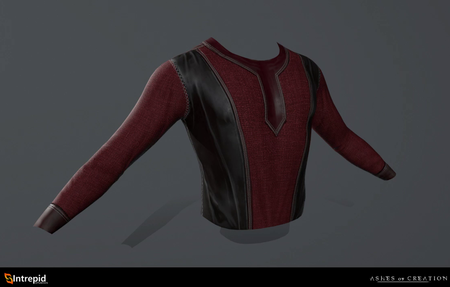 Nodes will be fully featured. Node progression to Village (Stage 3). This was previously stated to be Town (Stage 4). 120 km2 of world map. This is 25% of the total world space. 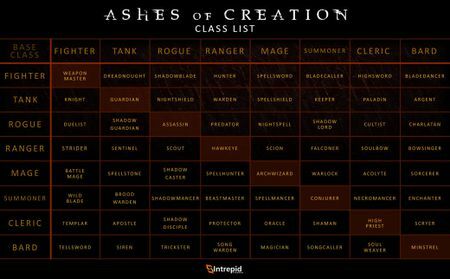 ↑ 1.0 1.1 1.2 1.3 1.4 1.5 Ashes of Creation class list. ↑ 4.0 4.1 February 8, 2019 - Questions and Answers. ↑ 5.0 5.1 5.2 5.3 Livestream, 28 July 2017 (19:05). ↑ 6.0 6.1 Interview, 20 October 2018 (1:45:09). ↑ 7.0 7.1 Livestream, 24 May 2017 (35:11). ↑ 8.0 8.1 Podcast, 23 April 2018 (59:28). ↑ 9.0 9.1 Podcast, 23 April 2018 (1:01:01). ↑ 10.0 10.1 10.2 Livestream, 11 January 2019 (41:20). ↑ 12.0 12.1 12.2 Interview, 17 August 2018 (8:16). ↑ 13.0 13.1 Livestream, 11 January 2019 (58:40). ↑ 15.0 15.1 Interview, 8 August 2018 (19:40). ↑ 16.0 16.1 Interview, 17 August 2018 (12:05). ↑ 17.0 17.1 Interview, 6 December 2018 (2:04). ↑ 24.0 24.1 Interview, 11 May 2018 (53:15). ↑ 27.0 27.1 27.2 Podcast, 11 May 2018 (49:20). ↑ Livestream, 18 July 2017 (37:43). ↑ Podcast, 4 May 2017 (17:02). ↑ 30.0 30.1 Livestream, 8 April 2018 (PM) (20:07). ↑ Livestream, 8 April 2018 (AM) (21:21). ↑ Livestream, 8 May 2017 (43:30). ↑ 33.0 33.1 Livestream, 18 July 2017 (35:58). ↑ Livestream, 8 April 2018 (AM) (25:52). ↑ 36.0 36.1 36.2 36.3 Group dynamics blog. ↑ 37.0 37.1 37.2 37.3 Livestream, 22 May 2017 (46:04). ↑ 38.0 38.1 Interview, 20 October 2018 (2:40:16). ↑ Livestream, 9 February 2018 (47:05). ↑ Livestream, 4 May 2018 (45:37). ↑ 45.0 45.1 Livestream, 12 May 2017 (24:52). ↑ 46.0 46.1 46.2 46.3 Livestream, 5 May 2017 (33:25). ↑ 50.0 50.1 Livestream, 17 November 2017 (14:57). ↑ Livestream, 3 September 2017 (30:31). ↑ 52.0 52.1 52.2 Livestream, 3 September 2017 (37:10). ↑ Video, 30 August 2017 (3:36). ↑ Livestream, 31 October 2018 (22:46). ↑ Livestream, 31 October 2018 (24:37). ↑ Video, 5 April 2018 (1:01:40). ↑ 60.0 60.1 60.2 60.3 60.4 Livestream, 1 September 2018 (1:02:99). ↑ 62.0 62.1 Interview, 8 August 2018 (19:02).